A good choice for landscape foundation plantings where you would like to have good evergreen coverage throughout the winter while keeping a low profile easy to maintain shrub that is deer resistant. To keep an appealing shape you will need to trim Green Velvet Boxwood at least once per year after the new growth has flushed out in spring. 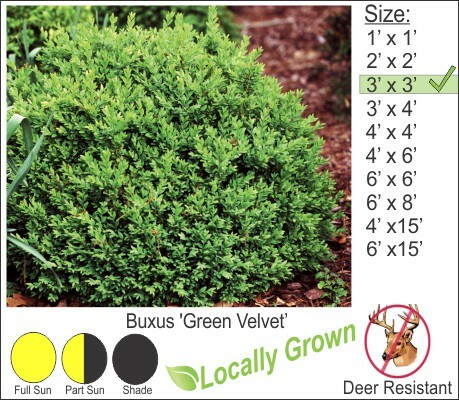 The Green Velvet Boxwood grows to 3 ft. in height and is perfect for English box gardens. You can plant this shrub in the shade but it will not grow as dense and will have a looser branching structure. I recommend this variety as a top choice for landscape plantings. You will need to occasionally control pests using a granular application.